^[a] The 49ers acquired an additional second-round selection (No. 56 overall) as part of a trade that sent quarterback Alex Smith to the Kansas City Chiefs. 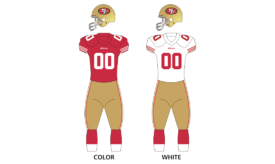 The Chiefs originally sent a third-round selection to the 49ers, however, the selection was upgraded to a second-rounder after a condition was met in which the Chiefs won a minimum of eight games during the 2013 season. ^[b] The Broncos traded their second- and fifth-round selections in 2014 (Nos. 63 and 171 overall, respectively) as well a fifth-round selection in the 2015 NFL Draft to the 49ers in exchange for a second- and seventh-round selection (Nos. 56 and 242 overall). ^[d] Jacksonville traded their third- and fifth-round selections (Nos. 70 and 150 overall) to the 49ers in exchange for the 49ers second-round selection (No. 61 overall). ^[e] The 49ers acquired an additional third-round selection (No. 77 overall) as part of a trade that sent their 2013 third-round selection to the Tennessee Titans. ^[f] Cleveland traded their fourth- and sixth-round selections (Nos. 106 and 180 overall) to the 49ers in exchange for the 49ers third-round selection (No. 95 overall). ^[g] The 49ers traded their sixth-round selection (No. 205 overall) to the Jacksonville Jaguars in exchange for quarterback Blaine Gabbert. ^[h] The 49ers acquired an additional seventh-round selection as (No. 242 overall) part of a trade that sent linebacker Parys Haralson to the New Orleans Saints. ^[i] The 49ers acquired an additional seventh-round selection (No. 243 overall) as part of a trade that sent safety Colin Jones to the Carolina Panthers. The 49ers would score touchdowns on each of three Cowboys turnovers, all before halftime. Even though the Cowboys held a significant edge in 1st quarter time of possession (13:26 to 1:34), the 49ers had a 21-3 lead due to the turnovers. With the 49ers up 28-3, the Cowboys would find themselves with their largest halftime deficit in a home opener ever. Although the 49ers would not score again in the second half, they would only hold the Cowboys to 14 more points, and win the game. In a pattern similar to the Dallas game of week one, the Niners jumped out to an early 17-0 lead, only to fall victim to a hailstorm of penalties, turnovers and a strong Bears comeback, 28-20. A blocked punt led to a Niner touchdown in the third minute of the game, but a seven-minute drive later in the quarter stalled in the red zone and only yielded a field goal. After a short punt in the second quarter, the Niners scored a second touchdown, but Chicago answered with their first touchdown just before halftime. To start the third quarter, the Niners held the ball for more than nine minutes. But they once again failed in the red zone, and settled for another field goal. The Bears scored three touchdowns in the second half to emerge with the win. The Niners were called on 16 penalties for 118 yards, losing one touchdown run, and keeping Bears' drives alive on multiple occasions. Colin Kaepernick threw three interceptions, lost a fumble, and was called for unsportsmanlike conduct after an interception. The Niners outgained Chicago 361-216, and held the Bears to only 46 rushing yards, but the overwhelming weight of the turnovers and penalties negated any other advantage. The Bears scored touchdowns the last four times they had the ball. This was also the first time since 1985 that the Bears won a road game against the 49ers, ending the Bears' 8-game road losing streak against the 49ers (the Bears were outscored in those 8 losses by a score of 271 to 49). For the third straight game, the Niners jumped out to an early lead, only to be shut out for the remainder of the game. And for the second straight game, mistakes and penalties allowed their opponent to take the victory. The Niners had pulled out to a 14-6 lead with 5:07 remaining in the second quarter, but saw the Cardinals score 17 unanswered points for a 23-14 victory. The Niners failed to score the last six times they had the ball, and racked up nine penalties for 107 yards, most in the second half. The Niners broke the pattern of their first three games, and mounted a second half comeback to beat the Eagles (the 49ers trailed 21-10 in the second quarter). Philadelphia exploited Niner mistakes to score first half touchdowns on a blocked punt recovery, an interception return and a punt return. But the defense never allowed a point by the Eagles offense, who had led the league in scoring through the first 3 weeks of the season, and on the strength of two Colin Kaepernick touchdown passes and four Phil Dawson field goals, they took a late 26-21 lead. Late in the game the Eagles moved to the Niner one yard line, but they turned the ball over on downs, and the Niners held on for the win. The Niners outgained the Eagles 407-213, and held the ball for 42:17. In a game that saw the return of Alex Smith to the Bay Area, the Niners prevailed in a see-saw game, 22-17, on the strength of five Phil Dawson field goals. Kansas City took an early lead on a Smith to Travis Kelce touchdown pass, but Colin Kaepernick hit Stevie Johnson with a TD pass just before halftime for a 13-10 lead. Smith struck again in the third quarter with a 17-yard scoring pass to De'Anthony Thomas, but Dawson hit three more field goals to give the Niners the win. The Niners outgained the Chiefs 357-264, and had a 36:04-23:56 time of possession advantage, but they only scored one touchdown in four trips into the red zone, continuing their season-long problem in that area. Behind Peyton Manning's four touchdown passes, the Broncos scored early and often, and administered a sound thrashing to the Niners, 42-17. After a Colin Kaepernick to Stevie Johnson touchdown pass had closed the halftime margin to 21-10, Denver exploded for three unanswered touchdowns in the third quarter to put the game away early. Manning was 22 of 26 for 318 yards and four touchdowns, with an almost-perfect quarterback rating of 157.2, as this was one of the worst displays of pass defense by the Niners in history. The Bronco defense held the Niners to 62 yards rushing and totally overwhelmed the offensive line. Colin Kaepernick fumbled away a quarterback sneak at the Rams 1 yard line with less than 10 seconds remaining in the game, and the Rams held on to upset the Niners, 13-10. The game was a defensive struggle, with both touchdowns scored on drives of less than 40 yards. The 49ers offense continued to struggle, not registering a single point in the 2nd half. With the season on the line, the 49ers got off to a quick start, leading 14-0 in the first quarter with a pair of rushing touchdowns by Frank Gore and Carlos Hyde. The Saints would rebound in the 2nd half to take a 24-21 lead. With 1:34 to go, and the 49ers facing a 4th and 10 from their own 22 yard line, Colin Kaepernick found a wide open Michael Crabtree for a 51-yard gain, that set up the game tying field goal. On the last play of regulation, the Saints appeared to have scored on a Hail Mary pass from Drew Brees, but the play was overturned by offensive pass interference. In overtime, Ahmad Brooks sacked Brees, causing a fumble recovered by the 49ers Chris Borland on the Saints' 17. On the very next play, Phil Dawson kicked the game winning field goal, giving the Niners a 27-24 win. This is the Saints first home loss in 12 games, and the first home loss under Sean Payton in 20 games (Payton was suspended for all of 2012 season). With the 49ers offense continuing to struggle in the game, the defense more than made up for it. The 49ers defense intercepted Giants QB Eli Manning 5 times and sacked him twice. In the 4th quarter, with the 49ers holding a 16-10 lead, the Giants marched down the field to the 49ers 4 yard line with 5:25 left to play. The 49ers defense forced 3 incomplete passes and rookie linebacker Chris Borland intercepted Eli Manning's throw on 4th and goal to preserve the win. This is the second time this season the 49ers defense had a goal line stand late in a game (Week 4 vs Eagles). Colin Kaepernick went 15/29 for 193 yards and a touchdown pass. Frank Gore had 19 carries for 95 yards. With the win, the 49ers move to 6-4 on the season. Carlos Hyde scored a rare fourth quarter touchdown for the Niners, and allowed them to hold off the Redskins, 17-13. The Thanksgiving night matchup against Seattle on national television turned out to be a Seahawk win. While the defense held Seattle to a touchdown and four field goals, the Niners only managed 164 yards of offense and one third quarter field goal. The offense, which traditionally collapsed this season in the face of second half adjustments, never got untracked at all, averaging 3.2 yards per pass and 3.6 yards per rush. Two Colin Kaepernick interceptions and a Perrish Cox fumble were the difference in the game. After the game, 49ers owner Jed York apologized to fans on Twitter for his team's poor performance. The Niners were defeated by local rival Oakland. One of the league's worst defenses dominated the Niner offense. The Niners went into halftime tied at 10 after a 52-yard field goal by Phil Dawson with one second remaining, and briefly led, 13-10 in the third quarter on another Dawson kick. Consecutive 80-yard touchdown drives in the second half by the Raiders condemned the Niners to defeat. For the first time in the Jim Harbaugh era, the 49ers lost their third consecutive game. The Niners were several point underdogs in this game, but managed to stay competitive throughout thanks to their defense. They sacked Russell Wilson five times, intercepted him once and held him to just 168 passing yards, while pressuring him throughout the game. But despite a second quarter touchdown by Frank Gore that gave them the lead at halftime, the offense was ineffective, and could not find a rhythm. This was the seventh time in the last eight games the 49ers offense failed to attain at least 20 points. Since week 7, the 49ers were last in the league in scoring (13.7 points per game). With the loss the 49ers were eliminated from playoff contention. The 49ers dominated the first half and led 28-7 at halftime. However, their second half offense stalled while the defense fell apart as the 49ers squandered a 21-point 3rd quarter lead and a 14-point lead in the final minutes of the 4th quarter. The Chargers outscored the 49ers 31-7 after halftime. Trailing 35-28, the Chargers drove down the field for the game tying touchdown, converting two 4th downs on that drive. The 49ers attempted to win in the final seconds of regulation, but Phil Dawson's 60 yard kick was way off. The game went to overtime. The 49ers got the ball first, but a fumble by Quinton Patton allowed the Chargers to have possession on their own 40. The Chargers drove the 49ers' 22 yard line before kicking a field goal to hand the 49ers their fourth straight loss. The 49ers rushed for an astonishing 355 yards, including a 52-yard touchdown run by Frank Gore and a 90-yard touchdown run by Colin Kaepernick. The 49ers set an NFL record for most rushing yards in a loss The 49ers also scored 35 points, a season high. However, their offensive struggles in the second half of games continued. During the four game losing streak, the 49ers have only 13 points in the second half of their games. They've been outscored 65-13 by opponents in the second half of those games. With the loss, the 49ers fell to 7-8, ensuring that they would finish without a winning record for the first time since the 2010 season. A strong defensive showing overcame the usual second half collapse by the offense, and the Niners held on for a 20-17 win, to even their season record at 8-8. The 49ers defense intercepted Cardinals QB Ryan Lindley three times and sacked him twice, shutting Arizona out in the second half. Phil Dawson kicked two field goals, and Bruce Miller caught a three-yard touchdown pass in the third quarter for the margin of victory. Frank Gore, who needed just 38 yards to reach 1,000 rushing yards on the year, rushed for 144 yards on 25 carries. It's the eight time in his career that he has rushed for 1,000 yards in a season. 49ers Wideout Anquan Boldin caught a 76-yard touchdown pass, giving him over 1,000 yards receiving for the year. This was the last game coached by 49ers head coach Jim Harbaugh, as he and the 49ers front office mutually agreed to cut ties after the game. In November 2013, Levi's Stadium and 49ers' officials initially requested the NFL to not schedule any weekday home games during the preseason or regular season — including Monday and Thursday Night Football — during Levi's Stadium's inaugural season, due to parking issues in the Santa Clara area during weekdays. Two months later (January 2014), the Santa Clara City Council approved a two-year deal with the Santa Clara Golf & Tennis Club that would have opened up 10,000 additional parking spaces within walking distance of Levi's Stadium, as well as reimbursed the club $250,000 for each year, which would have enabled the team to host Monday and Thursday night games for both the 2014 and 2015 seasons. However, the NFL decided not to schedule any weeknight prime-time games at Levi's Stadium during the 2014 season, for the exception of the Week 13 Thanksgiving game, until traffic flow within the area is figured out. ↑ Wilkening, Mike. "Agent: 49ers releasing LaMichael James". Pro Football Talk. Retrieved 11 September 2014. ↑ Wesseling, Chris. "Marcus Lattimore informs 49ers he intends to retire". NFL.com. Retrieved 6 November 2014. ↑ Matier, Phil (December 9, 2013). "Lack Of Parking Means No Monday Night Football At Levi's Stadium". CBS San Francisco. Retrieved December 31, 2013. ↑ Rosenberg, Mike (January 15, 2014). "49ers new stadium adding 10,000 parking spaces; Monday night games back on". San Jose Mercury News. Retrieved January 15, 2014. ↑ Biggs, Brad (March 25, 2014). "NFL uncertain of release date for 2014 schedule". Chicago Tribune. Retrieved March 25, 2014.